The show featured individualistic fashion sensibilities while experimenting with new materials like stainless steel organza and paper. 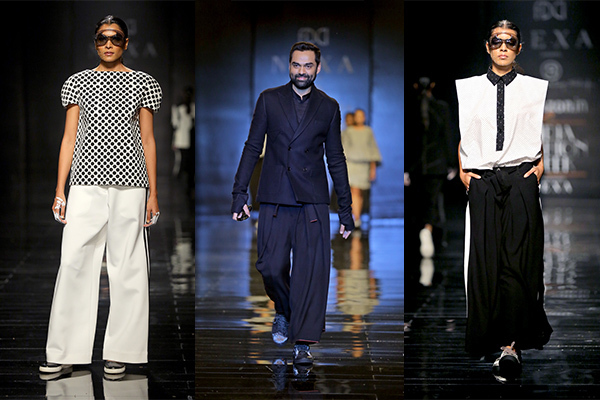 A graphic interplay of pop art prints, polka dots and stripes was visible in structured silhouettes for men and women. Celebrating their 25th year, the duo presented a line comprising of solid stripes in a largely monochrome palette. 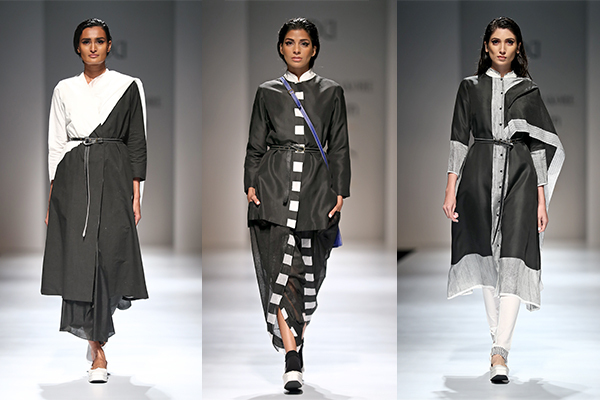 The sari was reinvented into structured drapes over kurtas and jackets. Menswear saw an interesting mix of layering over cotton bundis. 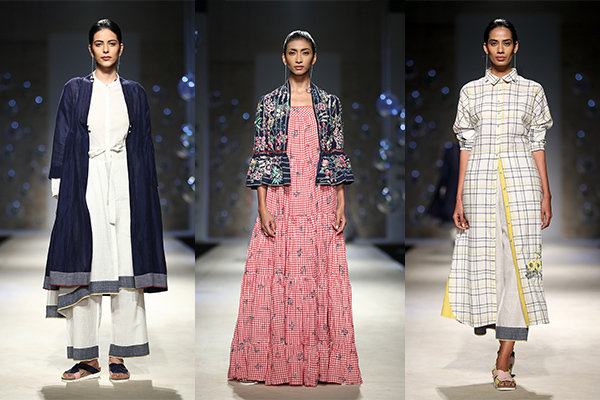 Botanical prints, handwoven stripes, checks and borders with selvedge details were seamlessly blended into comfortable summer dresses and jackets. The palette comprised of pastel hues like petal pinks, indigo blues and bright yellows. 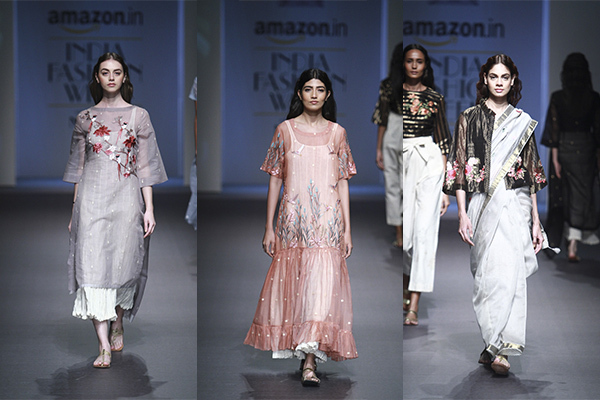 A sheer spectacle by Pratimaa, this collection featured dreamy kurtas and tunics with floral motifs over clearly visible full-length bodices. One of our favourite pieces was the sari paired with a jacket which was overlapped by the pallu. Interesting drape, that one. 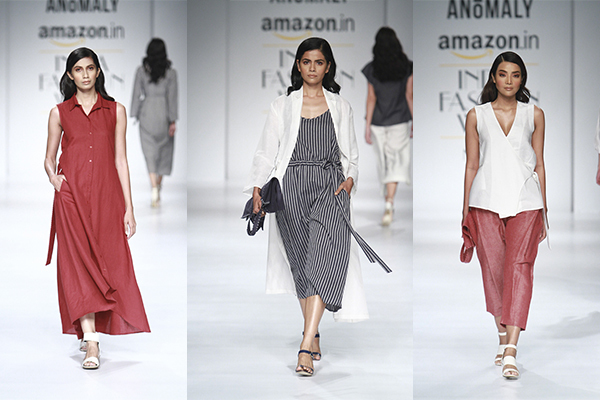 Pinnacle Shruti Sancheti’s initial showcase of all-white which included knee-length tunics with capes and bell-sleeved shirts with culottes (and a fanny pack!) was the definition of comfort wear. 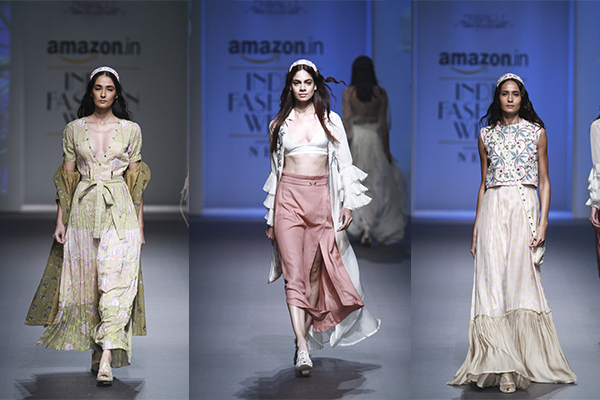 These gave way to glamorous bralettes and deep-necked bohemian dresses which exuded a very Coachella-esque vibe. 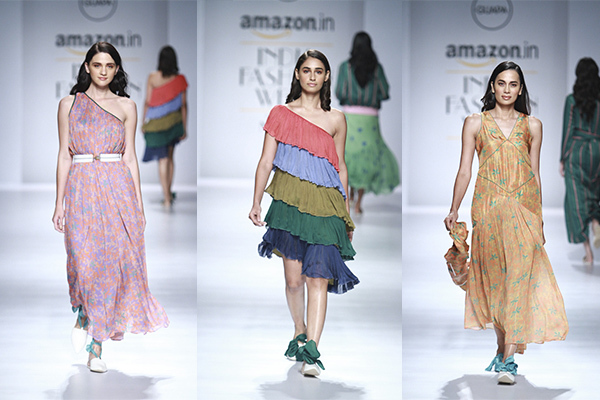 Pallavi Singhee essayed a collection on the lines of bohemian chic. 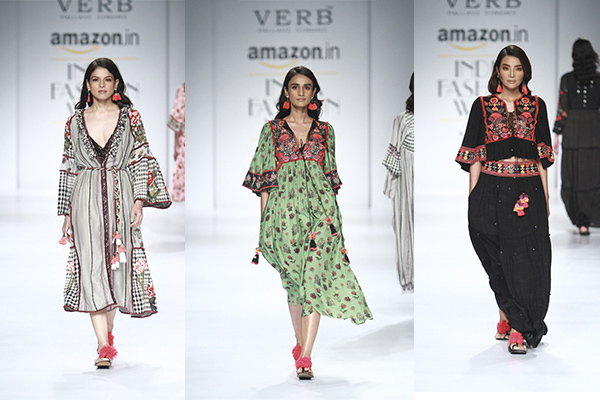 Bright red was the primary shade and the show saw a mix of patchwork dresses, kaftans tied at the waist and sheer coverups. Fabric manipulation and intricate thread embroideries were the highlights. The resort wear line by Guapa was all about colour blocking in various pop hues. From tiered beach dresses that had gathering details to coverups in an unusual clash of prints like florals and stripes, the ensembles were nothing but fun. 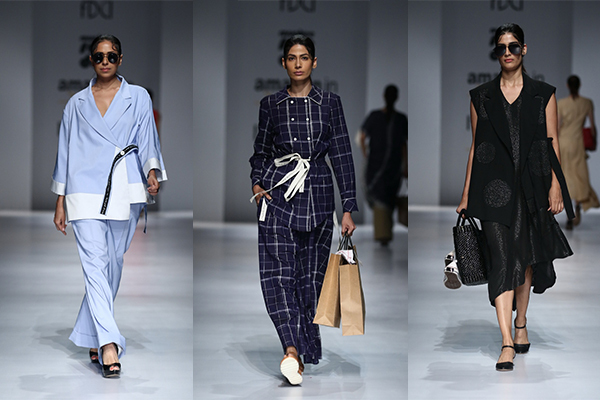 The runway saw relaxed separates like culottes, jumpsuits and shirtdresses in a combination of red, blue and white. Complemented with tote bags made with handloom cotton linen, the collection surely finds a place in our workwear wardrobe. This collection was the result of the designer’s speculation about the internal strength and independence of women through the prism of modern architecture. Paying tribute to the ideas of formalism, the collection played by the rules of the present. The fundamental idea of comfort and functionality was the cornerstone of this collection. Inspired by romantic nostalgia, this collection was a parade of classic patterns, such as checks, stripes and polka dots, all woven in irregular patterns. 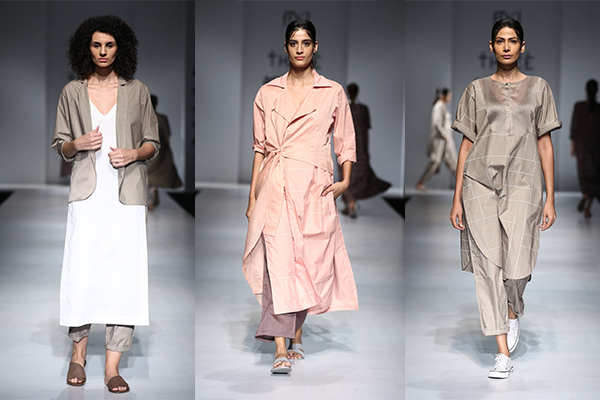 They were created using handloom cotton, viscose lurex and cotton spandex in a neutral palette of white, navy, khaki and black, broken up with shots of red, beige and sky blue. Each piece felt beautiful, yet practical for daily-wear. 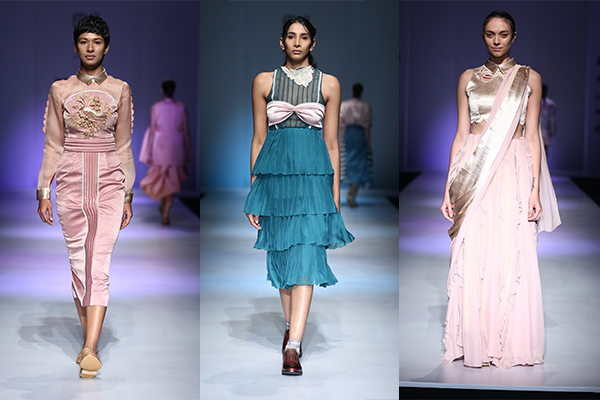 The collection, titled ‘The Girl Who Lost Things’ was an effervescence of soothing muted tones, quirky elements and cleanly modern silhouettes. The colour story started off with pristine whites and ended with strong midnight blues. The ensembles were intricately embroidered and coupled with leather and mesh detailing. They explored various surface techniques that build in collage style placement, leather cutwork along with beadwork and self-texture. Crisp white shirts with a twist, pleated and printed shift dresses, cut out and ruffled blouses, a range of skirts and a lot of emphasis on sheer made a strong statement for the fuss-free generation.